Pipsan Saarinen Swanson, daughter of Loja and Eliel Saarinen, readily accepted her parents’ all-encompassing approach to art, and during her long and successful career designed furniture, woven and printed textiles, clothing, metalwork, glass and interiors. She participated in Cranbrook’s early history both as an artist and an instructor, contributing decorative details to Cranbrook School for Boys (1926), Saarinen House (1930), and Kingswood School Cranbrook (1931), and offering several courses at Cranbrook Academy of Art in costume design and interior design in the mid-1930s. By the late 1930s Swanson directed her talents toward creating affordable modern home furnishings. She developed designs that could be mass-produced, in a sense offering the Cranbrook model to the general public. One of the manufacturers with which she worked was the United States Glass Company in Tiffin, Ohio, for which she designed these drinking glasses in 1946. 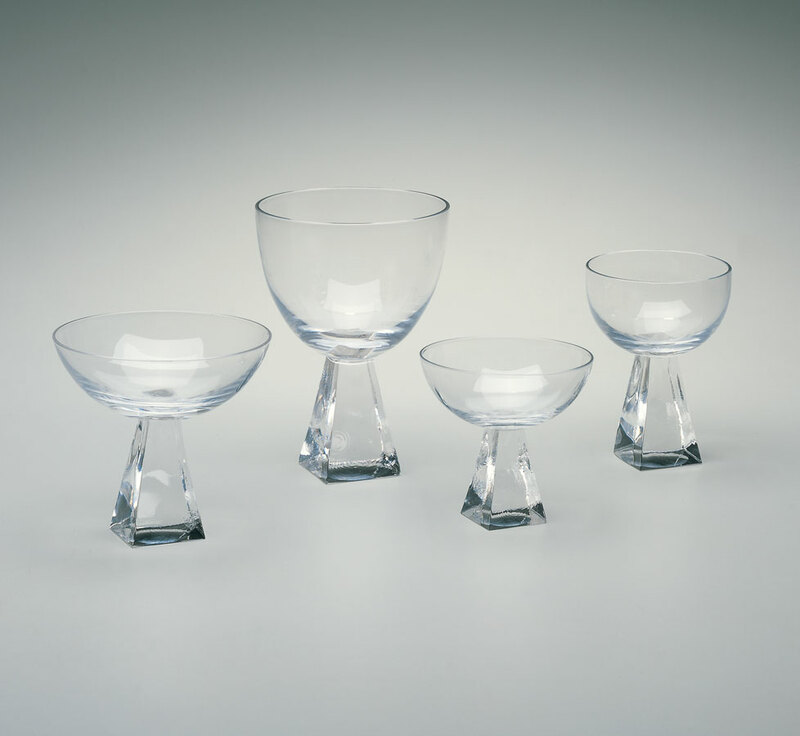 Tiffin engaged her as a designer from 1948–1950, and she created free-form vases, ashtrays, candleholders and flower floaters, as well as more traditional pressed glass dinnerware patterns.